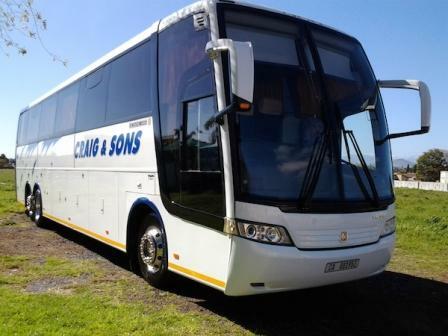 Craig and Sons Bus Services is an established company in Brackenfell, in the heart of the Western Cape with a small dedicated team and a hands on husband and wife run company. They provide transport services for charter, tourist and also learner transport services. They take great pride in all projects we undertake and customer satisfaction is our priority. No matter how big or small, They offer transport that suits your needs. They have invested much in Scania bus models but also they have othe buses from Volvo and MAN companies. Their buses are fitted with Marcopolo bodies, Irizar Bodies and Also bodies from South African Local builders like MCV. 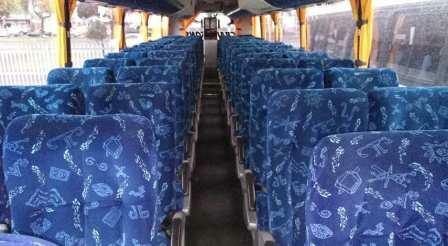 Their Buses have reclining seats with 2 by 2 seating arrangement as well as 2 by 3 seating arrangements. Most Of their buses have an A/C services throughout the journey and few of them lack this services. 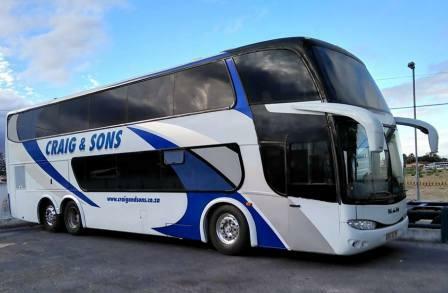 While you are traveling with Craig & Son Bus Services, You will enjoy on board entertainment like Television services, Good Music from their sound system and other cool features. Also some of their buses have free WiFi for their passengers. Their buses are available for Special Hire to all groups of people who need travel services from their company. You can hire their buses for Tourism trips, Wedding services, School Trips, Church Trips and other trip for all who need to travel with them. They are also provide Charter services to different group who can come into agreement with them for travel services. This services is available to Institutions, Workers, Government and other. They are also serve their buses for Learners.